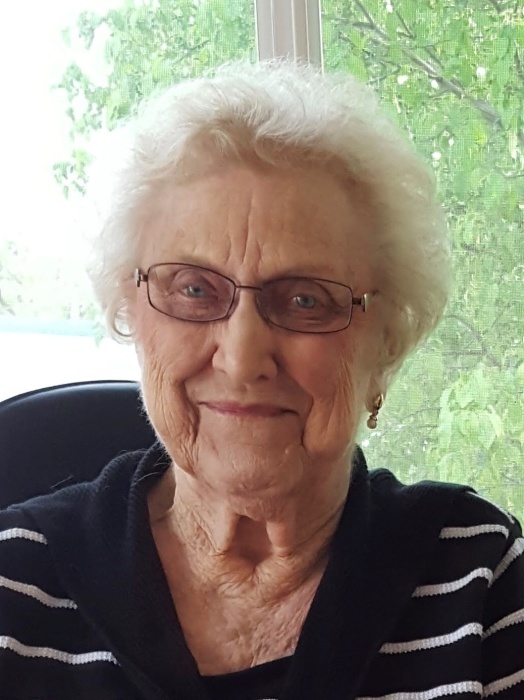 Evelyn C. (Grummert) Jordening, 88 years of age, of Lincoln, formerly of Fairbury passed away Wednesday, December 5, 2018 at the Sumner Place in Lincoln. She was born on March 18, 1930 in Plymouth to Edwin and Lora (Schmale) Grummert. Evelyn grew up in the Harbine area and moved to Fairbury where she graduated from Fairbury High School. She married Martin Jordening on September 3, 1950 at Peace Lutheran Church near Plymouth. They moved to the Daykin area until 1993 when they moved to Fairbury, and then Lincoln in 2014. Evelyn was a member of Immanuel Lutheran Church near Daykin where she was part of the Ladies Aid and also the Extension Club in Daykin. She enjoyed puzzles being known as the “Puzzle Lady” where she lived, cross stich, genealogy, baking and gardening. Evelyn adored her granddaughters and loved attending her great grandchildren’s activities. Evelyn is survived by her daughter, Debra Krumvieda and husband Jerry of Lincoln; granddaughters, Stacy Hillman of Weeping Water, Shelley Harding and husband Bobby of Omaha; great grandchildren, Trevor and Chloe Hillman, Michael, Nicholas and Zachary Harding; sister, Roberta Aden and husband Harold of DeWitt; and several nieces and nephews. She was preceded in death by her parents; husband, Martin on April 1, 2015; daughter, Lynn Ranae Jordening; sister, Dolores Eggert and husband Norman; brother, Leland Grummert; and brothers-in-law, Edwin Jordening and wife Edna, Raymond Jordening and wife Marjorie, Norman Jordening and wife Mildreth, Leo Jordening and wife Darlane. Funeral Services will be held at 11:00 AM Saturday, December 8, 2018 at Immanuel Lutheran Church near Daykin with Pastor Paul Beyer officiating. Interment will follow in the Immanuel Lutheran Cemetery near Daykin. Visitation will be held from noon to 8 PM with family greeting friends from 5 to 7 PM Friday, December 7, 2018 at Harman-Wright Mortuary in Beatrice. In lieu of flowers, memorials are suggested to Lutheran Hour Ministries in care of the mortuary. Harman-Wright Mortuary in Beatrice in charge of arrangements.